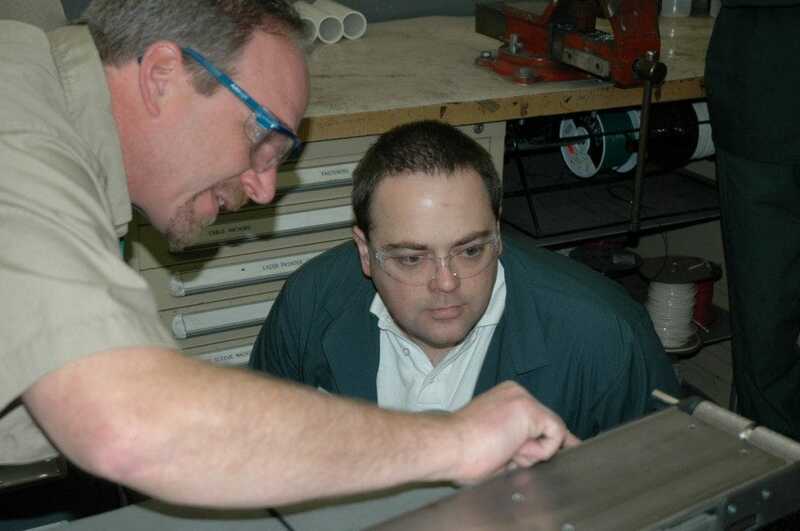 If something can break on a conveyor, Jeff Bonaparte has seen it-and repaired it. 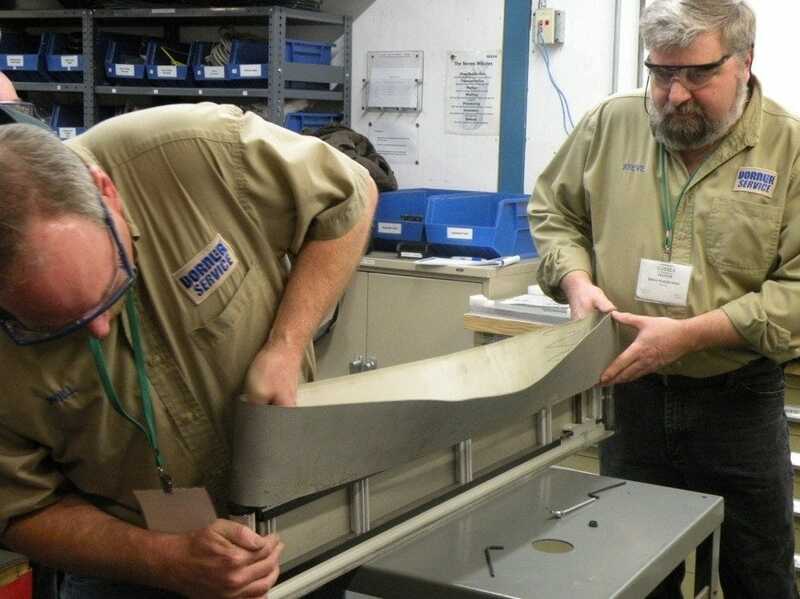 As a maintenance technician at Sussex IM, a custom injection molding manufacturer for a variety of industries located in Sussex, Wis., Bonaparte has literally seen it all when it comes to conveyor maintenance, and picked up a few tips along the way. Sussex IM has a fleet of more than 100 conveyors, some of which are more than 25 years old, so Bonaparte knows the importance of keeping them well maintained. Although modern-day conveyors are well designed to be virtually maintenance free, many older-model conveyors are still operating in plants across the country. But whether the model is two-months old or 20 years old, all conveyors need periodic maintenance to keep them running smoothly. To keep Sussex IM’s conveyors operating smoothly, Bonaparte and other members of the company’s maintenance team recently participated in a four-hour training course to review conveyor maintenance procedures, and learn how to update many of their older conveyors to newer models with enhanced bearings and other replacement OEM parts. Bonaparte sees this training as one component of an overall conveyor maintenance program for Sussex IM. Recurring training, as well as the nature of the application, environment and frequency of operation are just some of the factors that need to be considered when is designing a maintenance program for conveyors. A well-designed preventive maintenance program accomplishes three main goals: provides training for maintenance personnel and equipment operators, extends the service life of conveyors and proactively identifies areas in need of attention before they affect operation. These goals ultimately contribute to saving a company time and money by better managing resources and avoiding a costly shutdown of a production line. One of the first things to consider in setting up a preventive maintenance program is evaluating the type of environment in which the conveyors are operating. A wet environment, such as food processing, or one that’s harsh, such as a metal stamping, will require more attention to conveyors than a clean environment such as automation or packaging. Still, even a packaging application will leave dust that can collect on the conveyor and sensitive components in time. As a general rule, all operating conveyors should be inspected monthly, with those working in a dirty or harsh environment on a more frequent basis. Training is an important component of a preventive maintenance program. Maintenance personnel need to be up-to-date on the latest techniques and procedures in repairing conveyors, and in turn, they can train equipment operators on what to look for in detecting issues in their conveyors. This is important because the eyes and ears of employees who work alongside conveyors are often the first line of defense to detecting a potential problem. A good practice for equipment operators is to visually inspect conveyors in their work area before and after each shift. 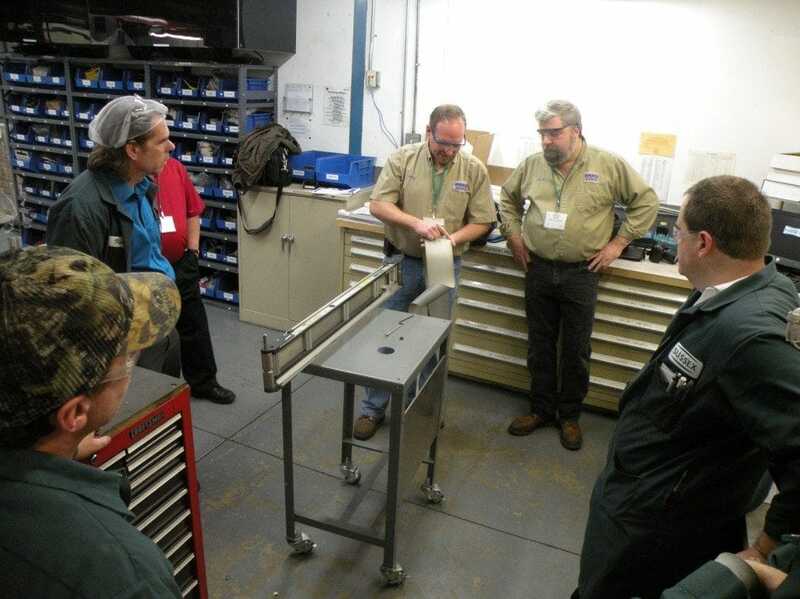 Manufacturers such as Dorner regularly conduct train-the-trainer sessions with custodial staff to review conveyor maintenance procedures; information can be passed on to equipment operators as well. While frontline workers don’t need to know the intricacies of conveyor design and operation, they should be aware of the warning signs of a looming problem, such as recognizing a frayed belt, belt slippage or hearing unfamiliar noises. These are signs that require further inspection and attention; early detection could minimize the problem plus avoid a more costly repair and downtime. When a conveyor does require maintenance, having a bench stock of common replacement OEM parts reduces down time. 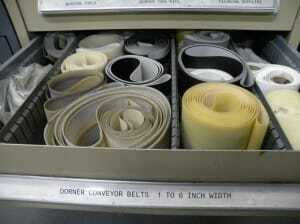 Items such as belts, bearings and drive belts are ideal parts to keep on hand. After operating your conveyors for a while, you?ll know which parts may require additional maintenance, so keep an extra stock of those items. With belts, a general rule is to keep at least two replacement belts for each style of conveyor operating in a plant. That way, if two belts are damaged in a matter of days, the belts can be quickly replaced with minimal downtime to the overall operation it supports. Additionally, some manufacturers, such as Dorner, offer kits of common replacement parts for their conveyors, which can be an easy, time saving way to keep parts for specific conveyors on hand for quick repairs. As a way to manage conveyor equipment, consider creating an inventory database of all facility conveyors to include key information such as model serial numbers , dimensions (length and belt width), type of motor, belt and bearings, date of last maintenance check and date of next inspection, type of maintenance performed, and phone number of the manufacturer. There?s no right or wrong way to create an inventory database; it can be as simple or extensive as you want it to be. The purpose is to get control of a company?s conveyor fleet and start tracking the conveyors, ultimately for improved performance. As Neuwirth said, conveyors, like other equipment, give off warning signs when a problem is developing. Belt tracking is the biggest problem that can shut down a conveyor. If a belt isn’t tracking properly, it will run along the edge of the conveyor frame and become frayed. Inspect the edges of the belt for fraying or signs of wear; these symptoms are a sign that the belt isn’t tracked properly. If possible, carefully touch the tail plate to check for warmth; heat is often a symptom of bearing wear/failure or a belt tracking issue. Heat is also a sign of friction caused by the slippage, i.e. the belt isn’t tensioned enough and the spindle is rolling over the belt and losing grip. Slippage can cause damage to the carcass of the belt. Some conveyors today come with V-guide tracking to help ensure true belt flow over the bed plate. As implied by its name, V-guide tracking has a V-shaped grove manufactured into the bed plate, with a polyurethane strip attached to the underside of the belt to provide consistent tracking. Additionally, inspect all guiding accessories on the conveyor to ensure there’s no contact with the belt; use a business card to slide between the belt and guiding to check. The belt splice, where the two ends are formed together, is a natural weak point in the belt. Inspect the belt splice for signs of wear, premature separation or any raised areas. Any failure found at the belt splice requires a belt change. It’s also important when changing a belt to replace it with one that is the correct size. For example, if a conveyor calls for an 11′ 7/8″ belt, and it’s replaced with one that measures 12′, it will not function well. For plastic chain belts, check for broken or missing pins, and ensure the sprockets are aligned properly with the belt. Unlike urethane belts, plastic chain belts are designed to stretch during the first four to six weeks of operation – sometimes as much as three percent during this break-in period. Belts should not stretch more than three percent during this time. As such, the belt may need to have some links removed. Be sure during reassembly to install the plastic chain belt in the right direction, and also check for any potential catch points along the conveyor belt. To help reduce wear and tear on the belt, turn off conveyors when not in use. Some companies let conveyors run several hours a day or overnight, even when a line is down. These unnecessary hours of operation will take a toll on the belt, bearings and motors. When the line isn’t operating, turn off the conveyors. When inspecting conveyor motors and drives, look for leaks, loose wires or any abnormal noises. Of course prior to performing any service on a motor remember to unplug the power cord for safety. Rollers on the conveyor need to be clean and free from debris. Material that collects under the belt or on the roller can affect belt tracking, increase friction or lead to premature wear. Many conveyors are mobile, and moved from line to line throughout the plant. It’s best to install casters on them so they can roll as opposed to be dragged across the floor, which could damage the conveyor stands and frame, and affect belt tracking. Stands with casters should have diagonal bracing to increase rigidity, durability and employee safety. Conveyors are often overlooked when it comes to maintenance of equipment out on the shop floor. That’s because they’ve built up a good reputation through the years for plugging it in and forgetting about it. But by being observant and following simple maintenance procedures, conveyors will keep product moving for years to come.